Rec: July 2001, St. Martin's Church, East Woodhay, England. The Möller manuscript, which originally belonged to Johann Gottfried Möller, a student of Johann Christian Kittel, who studied with Bach, contains about fifty pieces, and dates back to the period 1703-1708. It was copied by someone close to Johann Sebastian Bach, most likely one of his cousins. What is interesting about this manuscript is that it contains several early works by Bach, but also pieces that he played. This gives an idea of the type of works he was familiar with and which influenced him. The Metronome recording features a selection of the music in this manuscript: four works by Bach and seven by other composers. The disc opens with a bang. Bach's Toccata in D major BWV 912a (an early version of this toccata) begins with a flourish up and down the keyboard, and moves into a lively exposition. 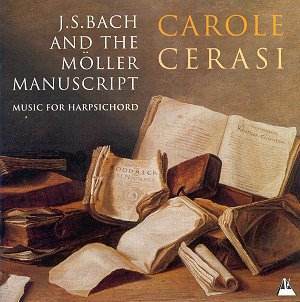 Cerasi uses this to show her stuff: sprightly, dynamic, inspired playing that dives head-first into the music and flows with it through all its changes. This toccata covers the full range of styles that Bach uses in his keyboard music: from the florid to the lyrical, from fantasy to counterpoint. It can be seen as a stylistic catalogue of the music of the period. Cerasi's performance gets my foot tapping in the final fast section, and has me entranced during the slower sections. Framed by two extroverted works by Bach is a selection of pieces from Bach's time, all of which are included in the Moller manuscript. These works cover a wide range of styles, and, while most are German, there is one French work by Lully, and many others clearly influenced by the French style. Not all the works are as virtuosic as the Toccata; some are more melodic, as are many of Bach's keyboard movements. One example is the fine Suite in B minor by Friedrich Wilhelm Zachow. This suite's movements alternate between slow and sinuous and more lively movements. The saraband is written very much like some of Bach's sarabands. The G major Chaconne by Jean-Baptiste Lully is a fine example of French variation sets of the period. This attractive, catchy melody is embellished and ornamented in a variety of ways in this short piece. Cerais plays this music on two different harpsichords, a Zell copy and a Fleischer copy. Both instruments are excellent; the Zell has a sparkling high end, which fits well with the highly ornamented French music and with the Bach toccata. The Fleischer has a richer, deeper sound, with more resonance, and sounds as though it is strung with brass strings. It is very fitting for the works in minor keys, since it brings out their melancholic tone (especially the Ritter and the Bach Capriccio). Cerasi plays this closing work with great sensitivity. With exuberant Bach to open proceedings and introspective Bach to close them, this recording contains a florilegium of the styles and forms that influenced Bach, as well as a few examples of his early works. This is a beautiful disc, and one that any lover of Bach's keyboard music will want to own, both for the three Bach works and the examples of his influences.